Ilsa Madden-Mills and Tia Louise bring a fun, cute romance to the reader with The Right Stud. While I found this predictable it was still a fun, charming read that I couldn’t put down and devoured. With two great characters that had fantastic chemistry, their banter, affection and hormones radiated off the pages as smiles and laughs were aplenty. This was definitely one of those quick, feel good reads. Ashton is still getting over the death of her grandma and has thrown herself into restoring the old house that she left to her and her brother. Ashton wants to keep her grandma alive by turning their once family home into a thriving bed and breakfast. Up to her eye balls in debt, thanks to her ex-fiancé, Ashton is jaded and incredibly skint, which leaves her to contact “The Right Stud” as a last resort. Jax is The Right Stud, a burgeoning reality tv star who renovates old houses on his video channel. His channel is hugely successful and he and his PA were currently vying for the series to be picked up by TV. Ashton’s house was perfect and so their paths crossed, but no before a hot encounter when neither knew who the other was. Ashton is extremely jaded with men in general and while I wanted her to wake up and smell the coffee at times, I could to an extent understand her and empathise. Jax was adorable and perfect, and given Ashton’s reticence to trust men, lies of omission were just as bad in her book. It is this part of the plot that was obvious and had me screaming at the kindle to just tell her, but alas, that not would have made for an entertaining read. 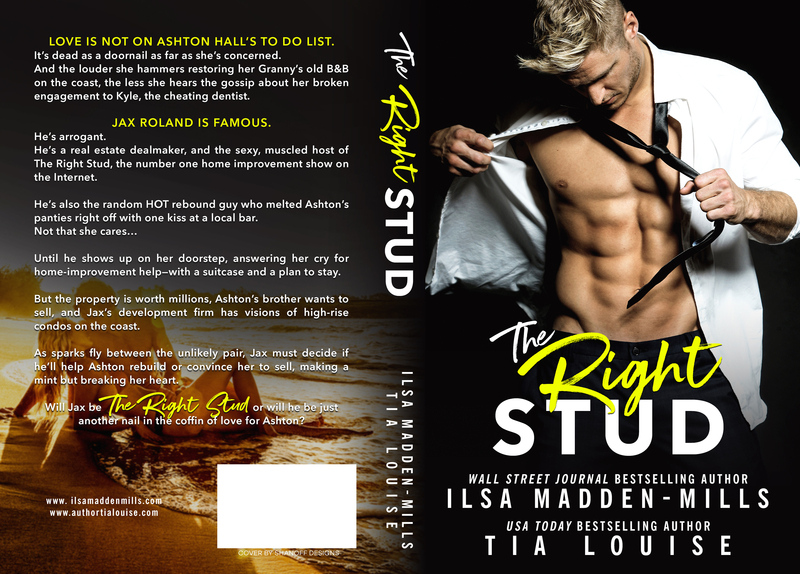 The Right Stud is fast paced, hilarious at times and had some fantastic secondary characters that really added value to Ashton and Jax’s story. I full on belly laughed at times and was swooning at all the others. These two authors certainly write well together and have always put out enjoyable, entertaining reads.